Preheat the oven to 300 degrees. In large bowl, combine the oats, brown sugar, cinnamon, almonds and salt. Add the honey, oil, and vanilla and stir until everything is well coated. Spread the granola out in an even layer on a large cookie sheet or pan. Bake the granola for 15 minutes. Give it a stir on the pan and then continue baking it another 15 minutes. Remove the pan from the oven, place it on baking racks, and sprinkle the chocolate chips over the top of the granola. When the chocolate is glossy and melted, stir it into the granola then let it cool. If making ahead, once cooled store it in an air tight container for up to a week. Spoon a few tablespoons of yogurt into the bottom of each glass. Top with a few tablespoons of granola, followed by some strawberry slices. Repeat these layers finishing with a dollop of yogurt on top. Garnish with strawberry slices and serve. The granola recipe makes 12 servings. Use all of it for parfaits or save the leftovers for snacking or dessert (it's wonderful sprinkled over vanilla bean ice cream). The suggested ingredient amounts for the parfaits serves approximately four. 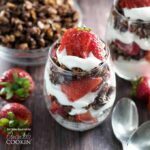 This recipe for Breakfast Parfaits with Strawberries & Dark Chocolate Granola was printed from AmandasCookin.com - https://amandascookin.com/breakfast-parfaits-homemade-granola/ and can only be printed for education or personal use.